Welcome to the MESAS research group in the Department of Geography and Earth Sciences at the University of North Carolina at Charlotte (UNC Charlotte). “MESAS” stands for Multidisciplinary Earth System and Atmospheric Sciences. MESAS research group members study observed and simulated processes related to our planet, with an emphasis on the role of the atmosphere. Questions and problems related to Earth System Science require expertise from multiple disciplines to make true advances. My name is Brian Magi, and this webpage outlines what I do and what my MESAS Research Group does (and has done) at UNC Charlotte. My expertise is atmospheric sciences, and my research questions explore both the human and the physical dimensions of the world around us. In addition to research, I teach courses in the Meteorology Program and the Earth and Environmental Sciences Program in the UNC Charlotte Department of Geography and Earth Sciences. Take a look at my research webpage, and email me if you want to talk about potential undergraduate and graduate student research opportunities here at UNC Charlotte. My publications and presentations pages are good places to start. You can virtually see UNC Charlotte campus, see current weather, or take a look at the campus webcam. I am always seeking out motivated undergraduate and graduate students to join the MESAS Research Group. My colleagues in the UNC Charlotte Meteorology Program include Dr. Casey Davenport, Dr. Matt Eastin, Dr. Jack Scheff, and Mr. Terry Shirley. My research has also intersected with geologist Dr. Missy Eppes, geographer Dr. Janni Sorensen, and remote senser Dr. Gang Chen, and several cross-campus collaborations with researchers such as Center for STEM Education guru Alisa Wickliff and Dr. Mark De Haven in the ARCHES program. A Geography department has a natural way of inducing multidisciplinary research, and new ideas and collaborations always seem to be right around the corner. 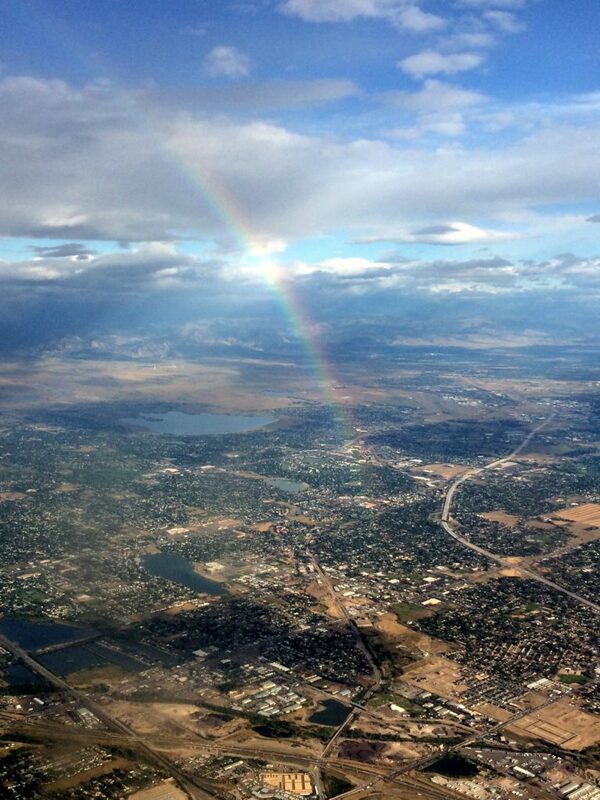 Rainbow as seen from an airplane leaving a city, capturing nicely how our amazing atmosphere is constantly a part of our lives. Photo by Dr. Magi’s sister.